New Feature Added Settings.asynchronous_com_events that if set to True will cause COM Events to serialize in a queue and fire in a new stack frame. New Feature Added WebKitX.StatusText property that reads window.status value. You should not poll this property, use OnWindowStatusChange event. New Feature WebKitX Setup code-signed with Thawte Code Signing Certificate by mobileFX Studio Ltd.
New Feature Copy of WebKitX Binaries are code-signed with Thawte Code Signing Certificate by mobileFX Studio Ltd, in ./bin/signed folder. New Feature Added Settings.allow_cancel_on_before_navigate that controls Cancel behavior of OnBeforeNavigate event. New Feature Added Settings.allow_browser_to_get_focus that enables browser window to get focus when setting focus to HTML5 elements. 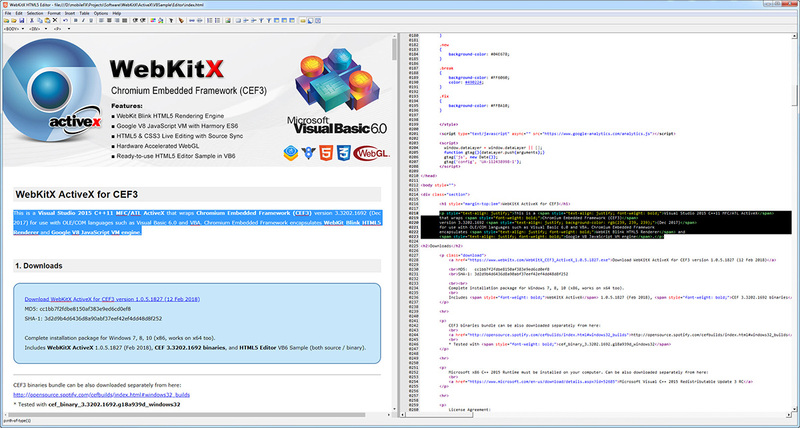 New Documentation Documentation available on https://www.webkitx.com/doc/light/about.html and as Compiled HTML Help File (.chm) in ActiveX. Hot Fix Fixed 64-bit bug causing page navigation to a URL to be cancelled. Hot Fix Fixed 64-bit IPC byte-alignment bug causing ActiveX Events with byref Cancel argument to malfunction. Hot Fix Fixed Ambient User Mode detection bug for Embarcadero RAD Studio products. Hot Fix Fixed intermittent licensing bug that was crashing the control on applications with multiple control instances. Hot Fix Fixed IPC problem where secondary Rendering Process that was failing to establish IPC with ActiveX causing intermittent errors. Hot Fix Fixed licensing bug related to Microsoft Wi-Fi Direct Virtual Adapter with random MAC address. Unfortunately, licensing algorithm had to change. Hot Fix Fixed postComMessage() not working with secondary Rendering Process(es) and IFRAMEs. Hot Fix Fixed synchronous events bug in CEF Message Router that was ignoring PreventDefault flag. 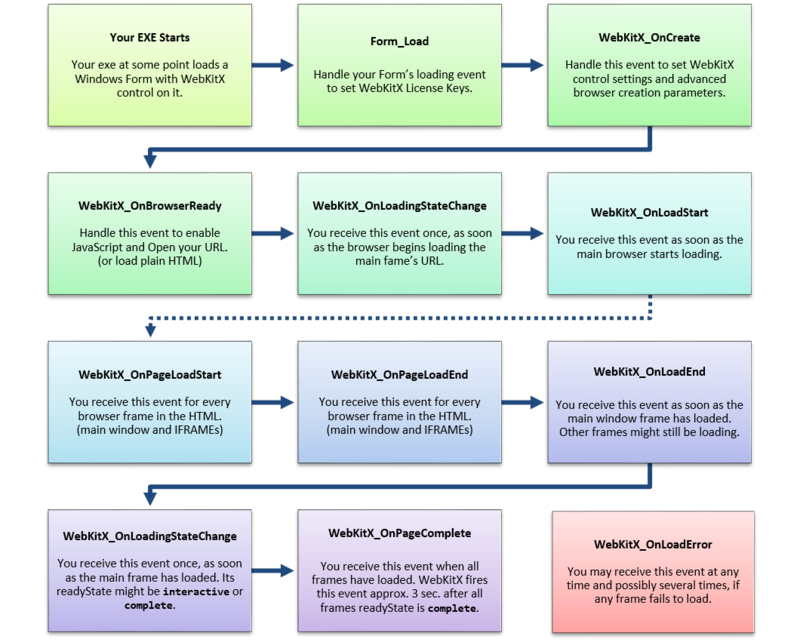 Hot Fix Fixed WebGL dependencies for Windows XP and Windows XPe. Hot Fix Implemented CefExecuteProcess for better control over sub-processes. Hot Fix Implemented support for Unicode command-line sub-process execution. Hot Fix Suppressed Flash popup message "NO SANDBOXED" that occurs when Chromium runs Flash with no sandbox. New Feature Added custom XMLSerializer to treat invalid XHTML generated from bad HTML documents. New Feature Added new event OnDocumentComplete() that fires when document and all IFRAMEs have completely loaded. New Feature Added PageLoaded property for polling page loading (please use timer and not loop). It is equivallent to document.readyState='complete'. New Feature Added Settings.string_for_null and Settings.string_for_undefined for controlling Eval(), postComMessage() and ExecCommand() result. New Feature Added WebKitX.HttpStatus property for current URL. 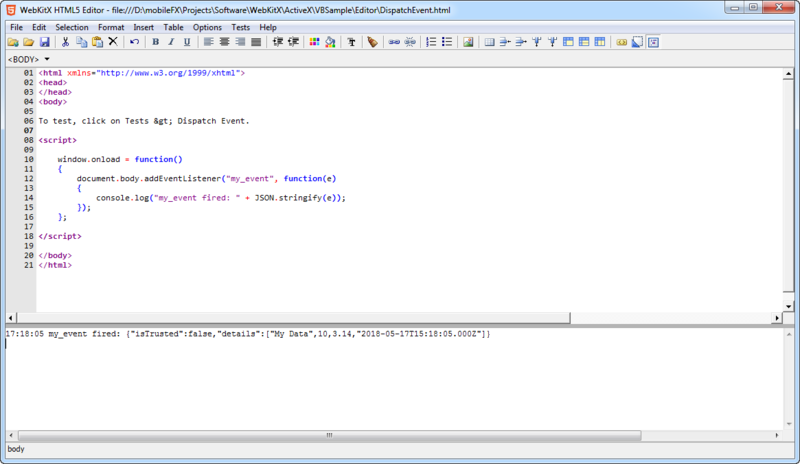 New Feature Added XML property that returns BODY element contents in XML format. New Feature Allowed background page loading without setting focus to control on URL open. New Feature Disabled debug.log file creation in same folder with WebKitX OCX file. New Feature Exceptions in Eval(), postComMessage() and ExecCommand() are stringified as __V8_EXCEPTION:<exception_message>. New Feature Improved IPC initialization between sub-processes. Faster OnBrowserReady() event. New Feature Repackaged v2.x component with Visual C++ 2017 redistributables. New Feature Unified V8 result value to string conversion for Eval(), postComMessage() and ExecCommand(). 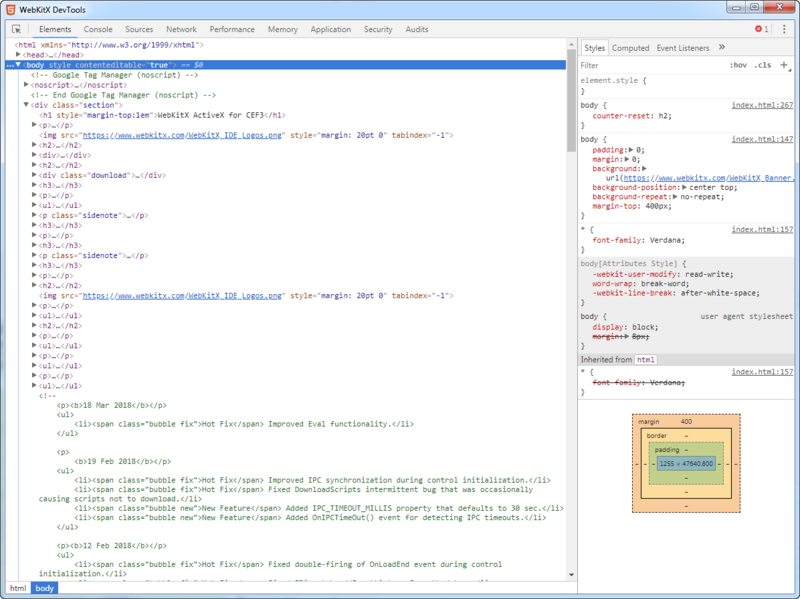 New Sample Added Simple Browser C# example for Any CPU and x64. 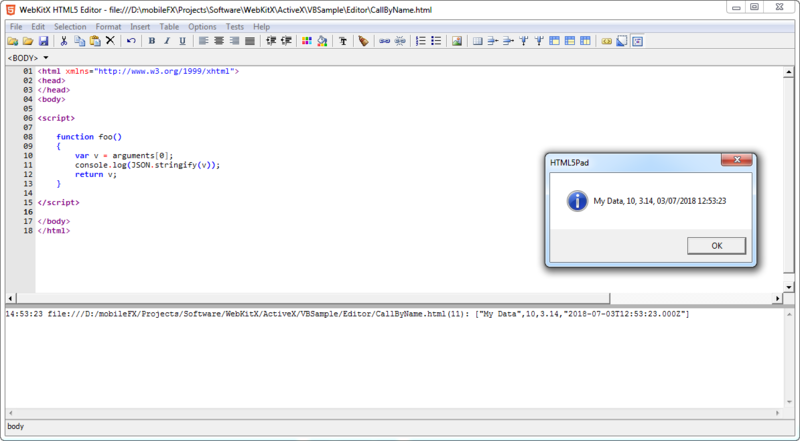 New Sample DeveloperUUID Sample demonstrates how to create and add the control on a Form programmatically. New Feature Added WebGL 1.0 Support on Windows XP ActiveX. Major Version Change New License Agreement for major version 2.x. Hot Fix Changed Eval() method implementation for speed. Hot Fix Fixed crashing bug related to Evaluation Notification window. Hot Fix Fixed Flash player DLL version bug. User-defined Flash version was ignored. Hot Fix Fixed licensing bug for 1.x version. Existing License Keys were failing to activeate the 1.x control. Hot Fix Fixed URL navigation bug (all versions). Redundant debug code was causing URL to be loaded twice with OnLoadError() event firing. Hot Fix Reissuing 64-bit installation package due to incorect packaging of CEF3 standard distribution that is shipped with 32-bit binaries instead of 64-bit. New Feature Flash Player support automatically detects installed DLL version if not provided in settings. New Feature Stability improvement, disabled CEF3XClient.exe Windows Error Reporting. New Feature Support for 64-bit Application Development. New Feature Support for Windows XP SP3 (x86). 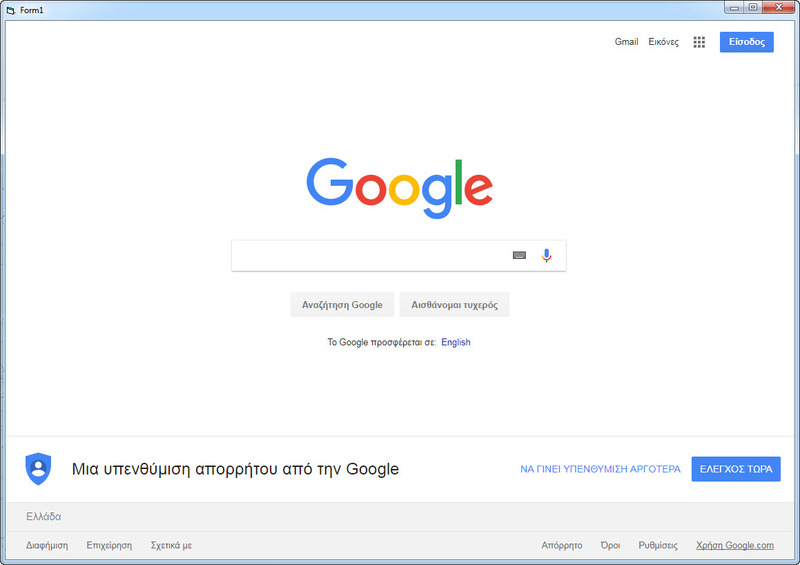 New Feature Upgraded to Latest CEF and Chromium (December 2018). New Sample New Visual Studio 2015/2017 C# HTML5 Editor sample. New Sample New Visual Studio 2017 C# 64-bit HTML5 Editor sample using 64-bit versions of WebKitX, CodeMax and CEF3. New Sample Updated C# samples to demonstrate CallByName() API using Object substitution for OLE Variants. WebKitX CEF3 ActiveX is a light-weight MFC ATL component for use with OLE/COM Programming Languages. At runtime the ActiveX starts CEF3XClient.exe process, passing to it its Window Handle (hWnd). 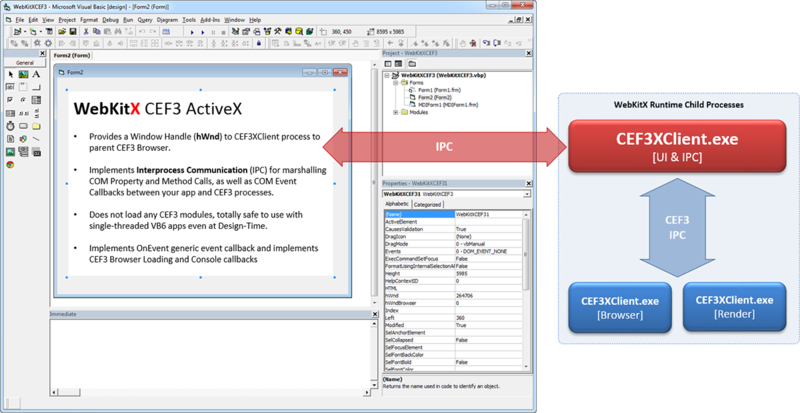 CEF3XClient Process starts CEF3 Browser and Render sub-processes and establishes a seamless back-to-back Interprocess Communication Mechanism (IPC) between the ActiveX and all CEF3 processes. Chrome Browser is parented in ActiveX hWnd but lives in its own process. All COM-based method and property calls between the ActiveX and CEF3XClients are marshalled using CoWaitForMultipleHandles, allowing your application's UI to be responsive. For time-consuming tasks, such as URL loading, COM events provide you callbacks when the tasks are finished. WebKitX supports PDF Viewer, PDF Printer, Flash Player and Chrome Developer Tools plugins out of the box. WebKitX provides methods to access HTML5 DOM through CSS3 selectors (Selector example td:nth-of-type(3) > span:first-child). Selectors are used as arguments in editing and styling method calls and as targets in events. The ActiveX provides the selector of the currently selected element and the begin and end nodes of the current selection: ActiveElement, SelAnchorElement, SelFocusElement. When you receive the OnLoadEnd and OnPageLoadEnd events, it means that network-wise the contents have downloaded but HTML-wise the contents might not be fully parsed yet. In HTML terms this means that document.readyState value might not not set to complete. Pages in window or sub frames might be in interactive state and resources might be loading in the background. The only event that guarantees that the main window frame and all sub-frames have document.readyState = complete is OnPageComplete. Internally, WebKitX uses an asynchronous task that checks the document.readyState for all frames; if this check result is "complete" with a count equal to browser frames, then the event is fired. If some frames have loaded while other frames have failed, the event will not fire. The check takes place on a fresh HTML DOM snapshot obtained every time at the moment of the check, and examines the current number of frames. The frames must remain unchanged for 3 seconds before the event is fired; this way, any dynamic loading or unloading of frames is taken into account. Please note that some frameworks such as Angular and React dynamically load portions of the page. WebKitX events will keep firing while dynamic content is downloaded. You need to examine the behavior of the control in relation with the web site you want to display and adjust your event handling accordingly. HTML5 DOM Events are generated by WebKit Blink Engine and are copied into an immutable format before they are transmitted from CEFXClient process to WebKitX ActiveX. Once WebKitX ActiveX receives an event notification through IPC, it fires a COM Event with the copied data of HTML DOM event. 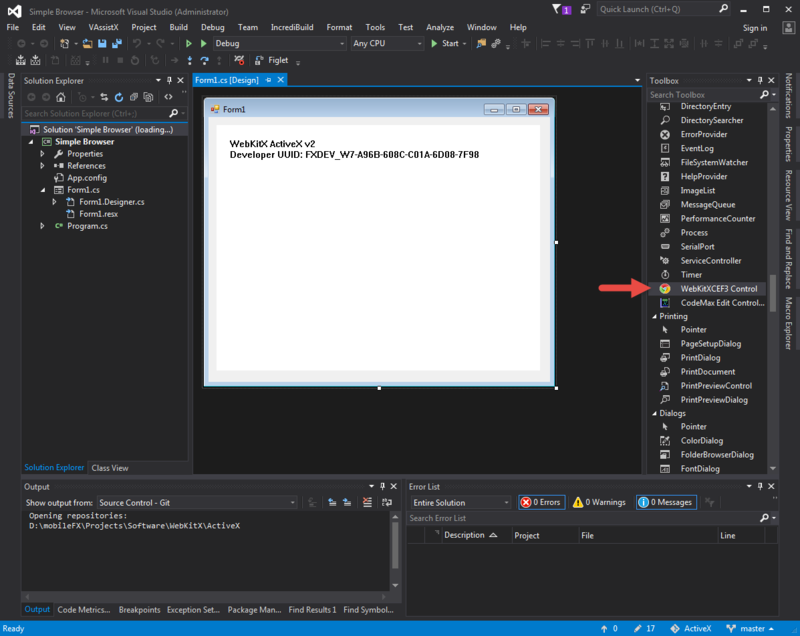 Thus, CEFXClient process does not block waiting for your client code to handle the event. WebKitX DOM Events are Immutable, meaning that you can only read event data but you cannot cancel events, stop them from bubbling or prevent default behavior. WebKitX supports synchronous DOM to COM events by implementing CefMessageRouter circuit. Events generated from WebKit Blink Engine are serialized and passed from Rendering to Browser process, which transmits them to the ActiveX. The browser process waits for the ActiveX to handle the event, where you can also cancel event bubble or prevent event's default behavior. WebKitX Content Filtering is a mechanism that allows you to remove HTTP Response Headers, such as Content Security Policy (CSP) response header, and alter or remove Cross Origin Resource Sharing (CORS) response header. WebKitX implements in CEF3 Client I/O Thread a custom Resource Handler that intercepts normal HTTP and HTTPS requests and spawns a light-weight object that downloads the resource instead. Once the HTTP Response Headers for a particular resource are available, they are being filtered-out and passed to the IO thread for further processing. This mechanism works for the following HTTP methods: GET, POST, HEAD, DELETE and PUT, and works for any MIME type resource. WebKitX content filtering works both with HTTP and HTTPS requests, meaning that it works perfectly with server-side SSL encryption, but it does not work if client-side SSL authentication is enabled. Please read further below for more information about Microsoft IIS Client SSL certificate configuration. Please read carefully our license agreement and do not hesitate to contact us if you have questions, or if you need to negotiate special closures. In a nutshell, a single License allows you to develop an unlimited number of Desktop Applications linked with WebKitX ActiveX control and distribute them freely to an unlimited number of your customers. The license excludes specific terminal-based applications that are subject to Terminal Application License below. Version 1.x Customers are entitled to 20% upgrade discount to Version 2.x at any time within 2019. Please contact info@mobilefx.com to request your upgrade. 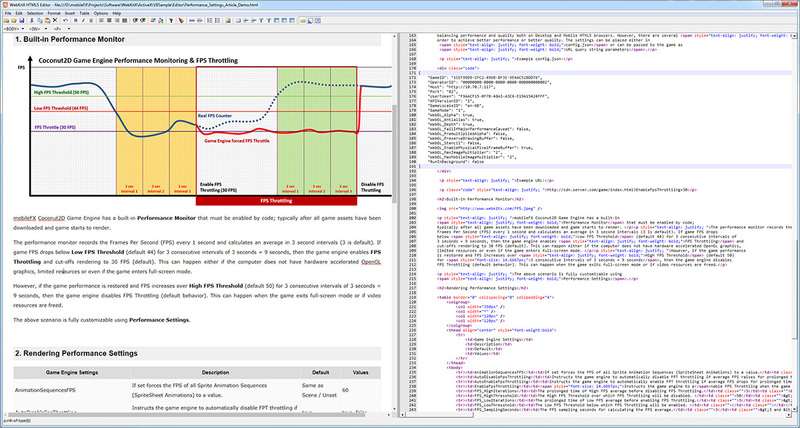 In version 1.x WebKitX ActiveX was shipped in two editions, the Browser and the Editor. 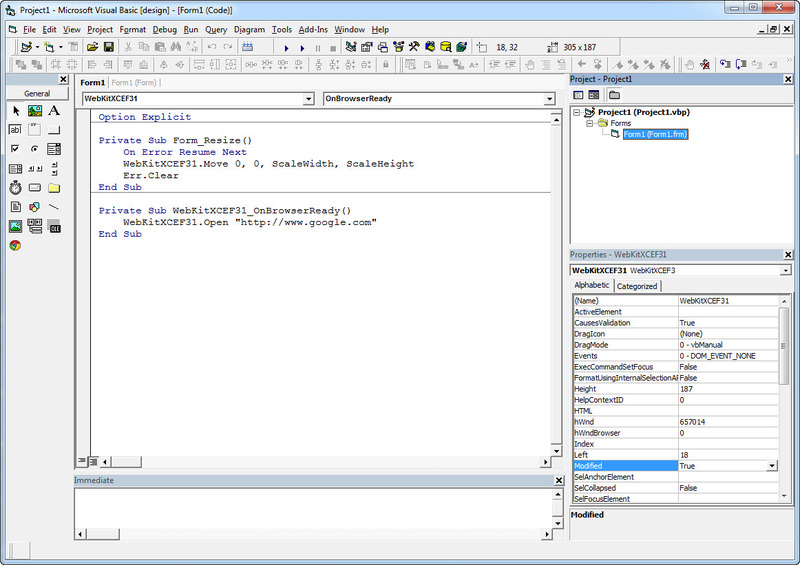 In version 2.x the control offers both functions in a single executable with no API restrictions. Do I need additional Licenses? If your application is installed and executed on Windows Desktop operating systems such as Windows XP, Vista, 7, 8, 10 and Windows Server editions, then you only need the Desktop Application License; to be absolutely clear about this, if your application is installed and executed on Windows Desktop operating systems such as Windows 7, 8, 10 and Windows Server editions, then you do not need Terminal Licenses. You will need Terminal Licenses only if your application will be installed and executed on Windows Embedded operating systems, or executed under a Terminal Server, or under a Virtual Machine. The Point of Sales Terminal License is the General Purpose Terminal License for all terminal applications not explicitly stated in the list above. Please contact us for Terminal License Volume Quotation. Alternative to automated PayPal order processing and only for company, school or university purchases, we offer a manual order processing and payment method via Purchase Order and IBAN wire transfer. Please create a Purchase Order (PO) document indicating the Software Name, Software Edition, Licenses Quantity and/or Support Vouchers Quantity you wish to purchase. You must also provide company, school or university name, address, telephone and contact details. If your company, school or university is registered in a European Union member country you must provide in your PO your VAT number, if applicable. Please forward your PO to info@mobilefx.com and upon processing you will receive payment instructions for IBAN Wire Transfer. Send us a PO with the Software Edition, qty, your company, school or university details. We reply with quotation PDF and a Quotation Number. Your company makes the payment through IBAN wire transfer with the Quotation Number in description field. 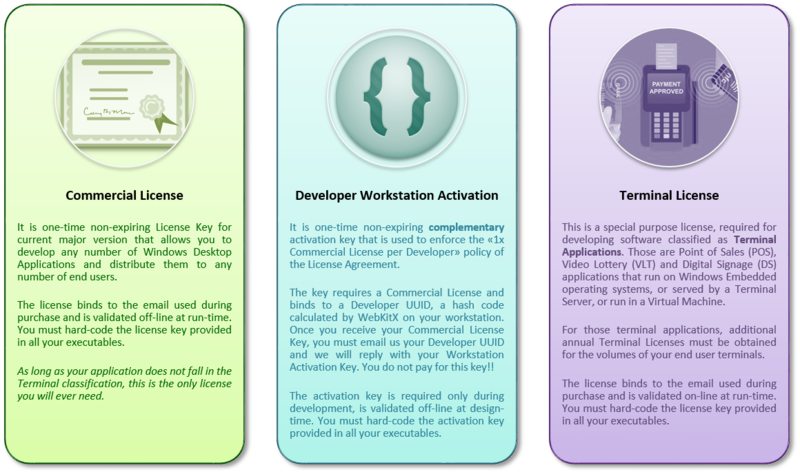 The Activation Keys are generated to Company Name. If you need them bound to an email, please specify this in PO. We send you the Activation Keys printed on the VAT invoice PDF. Let us know if something different is required in the steps above. Please do not hesitate to contact us for clarifications and assistance. What is Support Voucher / Bounty? If you desperately need a new feature implemented in WebKitX or immediately need a hotfix and can't wait until next release, you can contact us at info@mobilefx.com and negotiate with us a price, for which we will stop what we do and take care of what you need! The service is called a Bounty and applies only to existing Customers; for any edition of the ActiveX but only for its latest version (we do not branch per customer). Just send us an email with what you need and our Account Manager will pass your request to our Tech Lead for Effort Estimation along with Technical Specs of the works to be done. Effort Estimation is in man hours and it is different from Duration. For example, to add a feature it might take our experts 8 hours to implement, but because we work on Sprints we might need a duration of one week to deliver. The catch is that you participate in the process, being the primary Beta Tester! This phase is called User Acceptance Testing (UAT) and during this period you receive code-locked prototype revisions and provide us with valuable feedback, such as UAT observations and Defects. Once UAT is completed and you are satisfied with the result, you release us from the Bounty and we provide you with an Unlock Code as a token of our appreciation. For corporate customers and long projects we collaborate using Jira. For x86 your script must copy the files of the C:\Program Files (x86)\WebKitX CEF3 ActiveX\bin folder to the other computer. The destination folder is irrelevant and can be anywhere you choose. For x64 your script must copy the files of the C:\Program Files\WebKitX CEF3 ActiveX\bin folder to the other computer. For x86 your script must run Microsoft Visual C++ 2015 Redistributable Package (x86) for the Windows OS and Service Pack bundle of the other computer. For detailed information please see the WebKitX Runtime Dependencies paragraph above. For x64 your script must run Microsoft Visual C++ 2015 Redistributable Package (x64) for the Windows OS and Service Pack bundle of the other computer. If your product does not use Chrome DevTools, you may skip devtools_resources.pak to decrease size. If your product uses Flash Player you should add Pepper Flash Player. 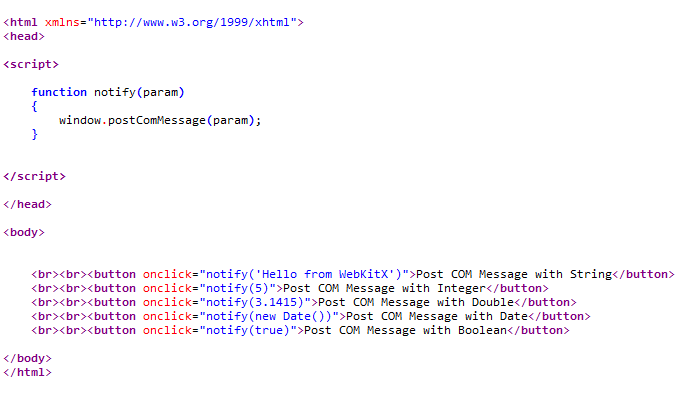 This is a simple, yet complete, sample of WebKitX CEF3 ActiveX control. The sample is shipped both as Visual Basic 6 source code project, as well as a complete binary bundle that includes CodeMax Editor ActiveX and CEF3 binaries. The sample demonstrates all WebKitX advanced features including FrontPage-like selection synchronization between HTML5 Designer and Source Editor, Table Editing, Selector API, and advanced CSS3 styling. 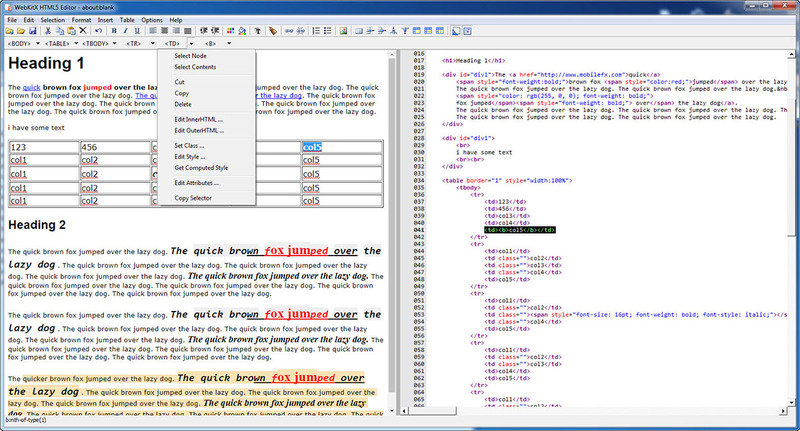 The binary bundle can be used as a royalties-free stand-alone HTML5 Editor. This sample demonstrates the WebKitX Browser. You can embed WebKitX in your applications with just 3 lines of code! 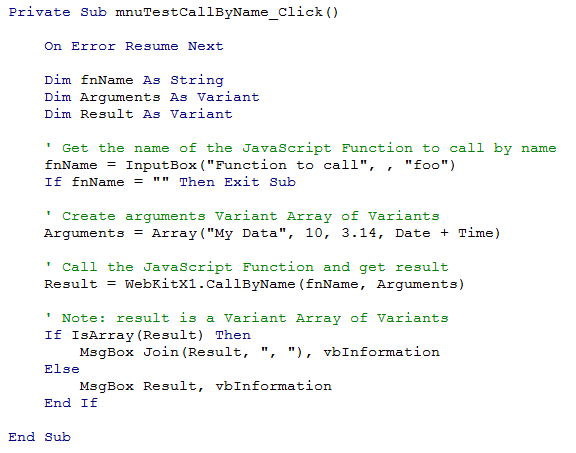 The sample demonstrates using WebKitX from C# for both 32-bit and 64-bit application development. CairoCanvasX is an HTML5 Canvas 2D Rendering Context for use with OLE/COM languages that does not require HTML5 run-time. 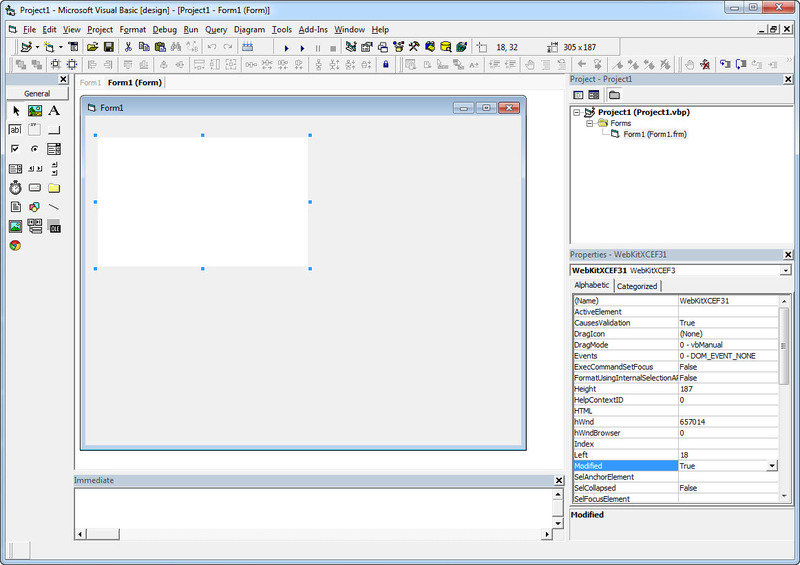 The ActiveX is linked with Cairo 2D Graphics Library version 1.10.2 from GTK+ 2.24 win32 implementation. This is a production-grade stable component for commercial use that will add hardware accelerated vector graphics in your desktop applications and 2D games. Effort has been made to preserve HTML5 canvas API in order to offer smooth web to desktop porting and vice versa. Coconut2D is an Integrated Development Environment (IDE) for WebGL Games and Classic ASP Web Applications powered by node.js. 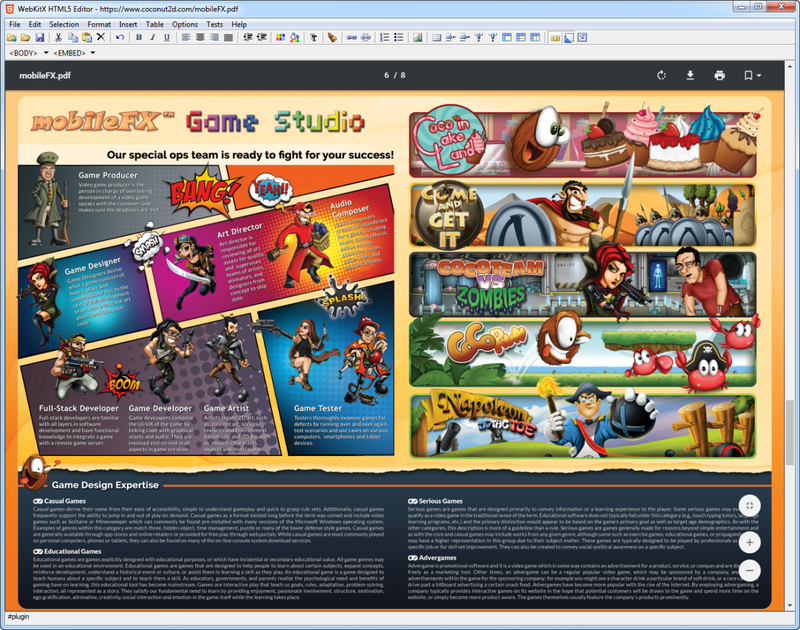 It looks and works a lot like Flash for games, with a Scene Designer and a 2D Animation Model, and like Dreamweaver for web apps with an HTML5 / ASP Editor powered by WebKitX Engine. 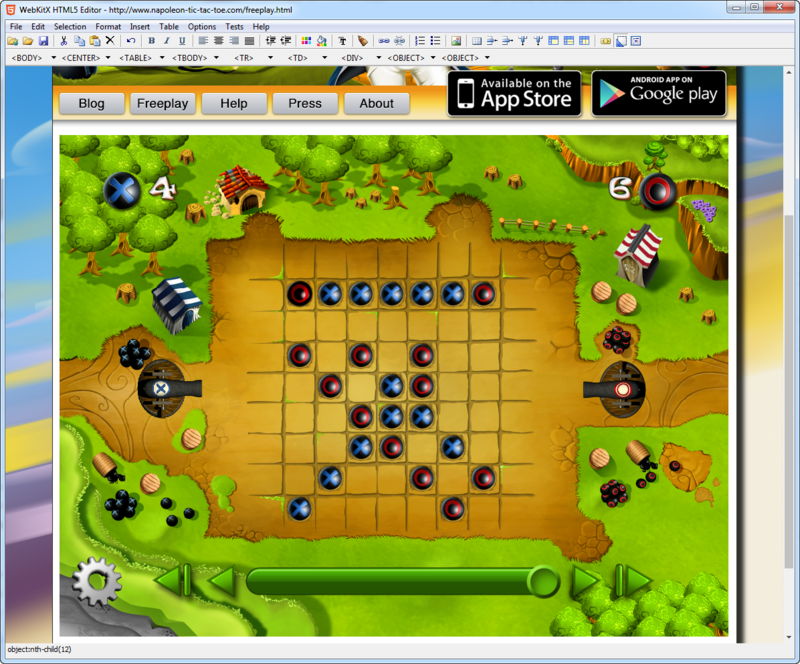 Coconut2D integrates both with Google Chrome and node.js allowing you to write and debug the client and the server code of your games. Coconut2D Market Place offers Plugins, Tools, Compilers, Frameworks and Assets that will boost your productivity and minimize your dependency on 3rd party tools.